Cause of Death: First show by Roxanne Wells, and then dies when the Meks blow up the station he is in. NOTE: DeathWatch is owned by Gary S. Carlson. In Little Rock, Arkansas, the elementary school janitor Johnny Lee Raeburn had a murderous reign that lasted from 1970 to 1976. Twenty-eight children were butchered by Raeburn until a near twenty-ninth escaped his clutches to lead police to Raeburn’s apartment. Convicted and sentenced to twelve consecutive life sentences by Judge Pulaski, even his own mother testified against him. When President Jimmy Carter sponsored NASA’s “Seeker” program, a program that sent convicted felons into space to monitor their life-signs on extended space voyages to examine Pluto and check for signs of Planet X, Johnny Lee Raeburn was blasted off into space on April 29, 1979 aboard Seeker 3. 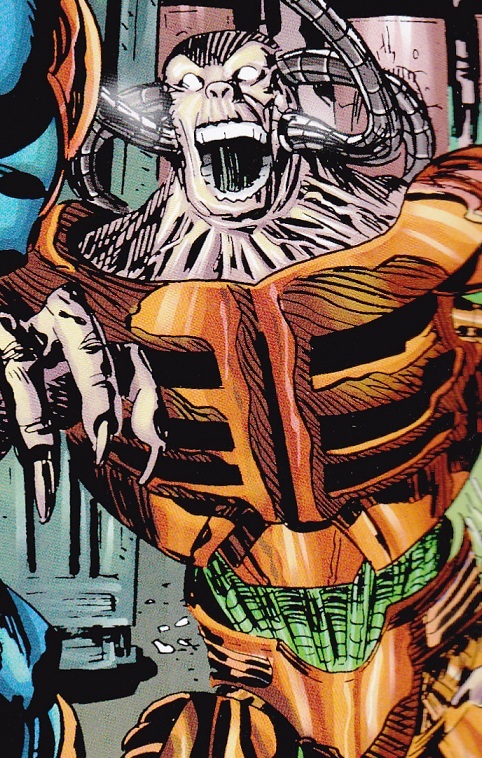 After a sixteen year trip to Pluto (during which time Seeker 3 became enveloped by a spacecraft belonging to the alien Turellans and a Turellan questprobe merged with him), Raeburn became a crazed, super-powered creature, and began a two year trip back to Earth, at the end of which he crash-landed. After adopting the name DeathWatch, Raeburn came to Chicago, Illinois to enact vengeance on Judge Pulaski. His efforts were stopped by Dragon, Donatello Of The Teenage Mutant Ninja Turtles, and Vanguard, forcing him to teleport elsewhere, though not before draining Donatello of his mind, leaving the cyborg part of the Turtle in charge. The Teenage Mutant Ninja Turtles then, with the help of Vanguard, traveled to DeathWatch’s hometown of Sheldon, Arkansas. Finding the entire populace of the town massacred, including DeathWatch’s own mother, Donatello and Vanguard confronted DeathWatch a second time. This time, before transporting away again, DeathWatch critically injured Donatello, impaling him through the chest and tearing off his arm. Years Later Vanguard encountered Deathwatch when Vanguard returned to his home planet. He is shot dead by Roxanne Wells, but returns back to life when he touched by Lurch. Lurch is unable to rid his mind of Deathwatch so the Meks blow up the city they are all in finally killing Deathwatch.